You have heard of the parable of the sower before. It is recorded in Mark 4 and in Matthew 13. We will not copy it here because of its length. But essentially, you have a sower who went out to sow (Mark 4:3). Some seeds fall by the way side (verse 4) and the fowls of the air devour them. Some fall on stony ground (verse 5), then grow immediately because there is no much dirt. However, when the sun comes up, they die quickly. Others fall among thorns (verse 7), but they are chocked by them when those thorns grow up. And some fall on good ground (verse 8), and end up yielding fruits in abundance and even superabundance. We shall call them “way side”, “stony ground”, “among thorns” and “good ground”. Our Lord Jesus explains this parable in Mark 4:14-20. In all four cases, the ground refers to people, the seed is the Word of God, and all four types of people “hear” the Word (verses 15, 16, 18 and 20). However, only two of the four types (“stony ground” and “good ground”) actually “receive” the Word. This said, a little study of the two verbs “to hear” and “to receive” (or “to accept” depending on the version of your bible) reveals that much of the real meaning of this parable has been lost in most English translations. It’s about HOW you Hear! When looking at how the verb “to hear” is conjugated in each of the four cases, we find that only in the case of the good ground (verse 20) is this verb in the “Present Indicative Active”. In other words, this is the only group of people that hear and keep hearing continuously the Word of God! These people are plugged to Christ! In stark contrast, the same verb is in the “Aorist” tense in all of the first three groups (“way side”, “stony ground” and “among thorns”). This tense means that this action of hearing is not continuous or habitual. The reason for them not producing fruit is because they do not keep on hearing the Word of Christ. So what about the stony ground? The only other group mentioned as receiving the Word? Not only did they “receive” it, but our Lord says that they receive it “immediately” and “with gladness”. But then our Lord says that they “immediately” stumble when tribulation comes because they have no root (verse 17). Ouch! What went wrong? It’s about HOW you Receive! See, we already established that the first problem with all the groups except good ground is that they do not make it a habit to hear the Word. In the worst case, they hear it one time and that is it. But now focusing on the verb “to receive”, we see that in the case of stony ground (verse 16), the greek verb is lambano, while in the case of good ground it is the greek verb para-dechomai. In a nutshell, these two verbs focus on two “very” different aspects of the reception process. Lambano emphasizes the manifestation of what has been received while para-dechomai emphasizes the strong and loving acceptance of what has been received. An example of lambano is found in Acts 19, where Paul ends up laying His hand on some people so they may receive (lambano) the Holy Spirit. Acts 19:2,6 – He said unto them, Have ye received (lambano) the Holy Ghost since ye believed?… 6 And when Paul had laid his hands upon them, the Holy Ghost came on them; and they spake with tongues, and prophesied. There was a clear manifestation/evidence of the reception: They spoke with tongues and prophesied. In the case of the stony ground, the manifestation is that they immediately start to speak or preach what they have just been taught. How do we know? Verse 17 says that it is for “the Word’s sake that they face tribulations”. They do not just get tribulations for any reason. They are attacked specifically on their faith. But that faith is weak because they do not continue to hear! They are batteries and they run out, they are not plugs! Para-dechomai is actually a stronger form of the verb “decomai” and it is used only 6 times in the New Testament. One of the other five is this great record in Hebrews. Hebrews 12:6 – My son, do not despise the chastening of the Lord, Nor be discouraged when you are rebuked by Him; 6 For whom the Lord loves He chastens, And scourges every son whom He receives (para-dechomai). Can you sense the intense love God has for us? How He receives us? And by the way, this is also in the present tense, meaning, the Lord continually receives us! Wow!! Want to talk about being accepted by Him? Here you have it! So what’s the deal here? 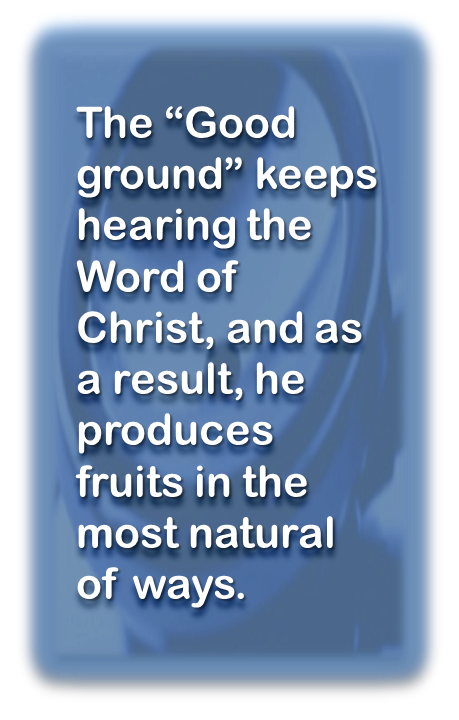 “Good ground” hears and keeps on hearing the Word. As a result, he starts to accept and receive this Word, becoming one with it, loving it, making it his very own. He cannot get enough of it! So he never forgets that he needs to stay plugged, and as a result, he produces fruits in the most natural of ways, and even in great abundance. Stony ground hears it once, gets extremely excited. Heck, it seems to be the most excited of all! But then he takes the little he received and runs with it. What a pity! Why do you leave? You are battery on your own, and soon after, you are out of juice! What is the takeaway? Stay plugged! Keep on hearing! Let’s not focus on what we can do, like stony ground did. The Word calls that our works. Instead, let’s focus on being close to Him, simply listening to Him, day in and day out (2 Timothy 1:9). Bearing fruits is not about exerting effort of our own, but about letting His Word dwell in us richly! He who drinks from Him (i.e. He who hears Him) will never thirst and out of him will flow rivers of living waters (John 7: 37, 38 – you want to talk about producing fruits?!). The “Quantity” argument. Click here for part 4. It is very interesting to observe that virtually all of the newer bible translations clearly side with the quantity argument in verse 6. One may verify this by visiting a site such as BibleGateway.com. Does this reflect a greater understanding of the original Word of God…or a greater distortion of It? Some of the older ones (such as the highly respected King James Version) do to, but certainly not to the extent of newer ones. Now, if the quantity argument is so prevalent today, then it must addressed head-on. In other words, let’s now suppose that verse 6 does indeed speak of quantity. As we shall see, this passage then becomes a very complex and incomplete piece of scripture! To make this verse speaks of quantity paves the way for all kind of confusion…and abuses! Here we go. Is verse 6 speaking of quantity in absolute terms or in relative terms? Where is the cutoff point between sparingly and generously? It is at 5% of what you have, 10%, or 20%? If there is one such cutoff point, why is it not mentioned here? Here is something else…what if you give cheerfully (as verse 7 encourages), but only 2% of what you have…does your giving overrides the quantity to give requirement? And what if you give grudgingly (as verse 7 discourages), but a full 70% of what you have…does your giving overrides the attitude in giving requirement? There is yet something else. What if you and someone else are to give a certain combined amount, and whatever the other gives, you will give the rest…Did you give the right amount even if the other gave 95% of the amount and you 5%? And would not this last case imply that the quality of your giving is conditioned by the giving of another? Since when your standing with God is dependent on someone else’s? To make this verse speaks of quantity make the first part of verse 7 irrelevant and downright confusing! According to verse 7, each one is to give as he purposes in his heart. But if that is the proper way to give, why are we being warned just before (verse 6) that giving little will have negative consequences? If verse 6 indeed speaks of quantity, then it effectively makes the first past of verse 7 completely irrelevant, and even – dare we say – very confusing. That is because the only correct amount to give, which is “much” was already stressed in verse 6. Who cares what one purposes in his or her heart…just give much, and you will right in the sight of God! If there is a reference to quantity, it is in verse 7, not verse 6! 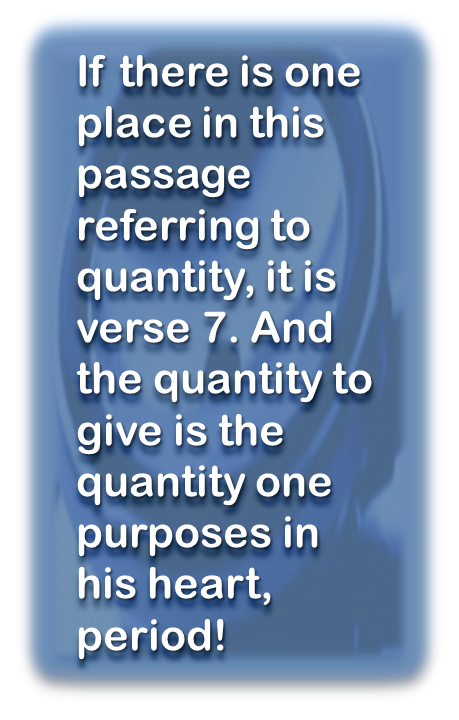 If there is one place in this passage referring to quantity, it is precisely the first part of verse 7. And the quantity requirement is that it should be the quantity one purposes in his heart, period! That is the quantity to give. And look, the verse then goes right back to the motivation in the giving, the whole purpose of this entire section. It is our belief that there is simply no room for the quantity argument in verse 6. The very small sample of problematic questions that were raised in this article gives us a glimpse at the kind of abuses the quantity argument permits. This is the case because if the Bible does not answer those questions, then it effectively delegates this responsibility to our church leaders…and that is where all hell brake loose! The fact that most newer bible translations side with quantity clearly reflect the deliberate choice our so called bible scholars and authorities have made. And we can understood why! And these are the bibles you and I read! How sad! How v-e-r-r-r-r-y sad! Anyway…what’s next? Well, after a brief look at the immediate context of this passage, precisely, verse 5, which further supports the motivation in giving argument of this series, we shall conclude with a reflection of the implication of this study. 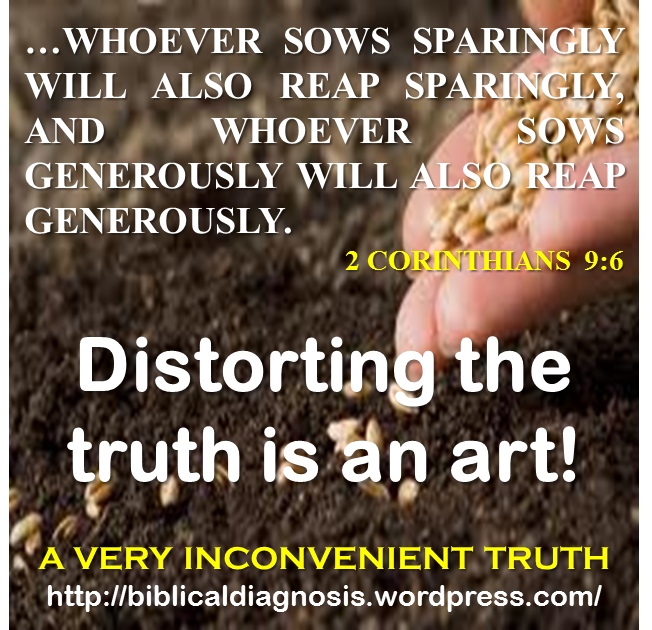 2 Corinthians 9:6 –…and he who sows on the basis of blessings will also reap blessings. Interestingly, this part does not suffer from any of the two issues we identified in the second, namely, the poor translation of a word and the outright omission of another. But what we will argue is that the issue at a hand is simply a matter of interpretation of the adverb “sparingly”. The Greek word for “sparingly” is pheidomenós and it comes from the verb pheidomai which means to spare, or to abstain. A search of this adverb in Merriam-Webster dictionary gives sparing, which is the act of giving or sharing as little as possible. It also refers to less plentiful than what is normal, necessary, or desirable. There is certainly a strong reference to quantity in this definition, and that is precisely how it is mostly understood in verse 6. But there is something rather peculiar about sparingly. It turns out that 2 Corinthians 9:6 is the only place in the New Testament where the word pheidomenós is used. The implications of this fact is that there are essentially two options when it comes to defining this term. The first is to work with a secular dictionary such Merriam-Webster’s. The second is to stay right here in this verse and explain it from here. We are of the belief that the best option is to stay right here, in this verse. So here we go! A little bit of Set theory from Mathematics, shall we!? The two statements of verse 6 are the exact opposite of each other. The implication of this seemingly obvious conclusion is actually quite profound. The implication is that understanding of one of the two statements automatically leads to understanding the other. From part 3, the second part of verse 6 is quite clear… and he who sows on the basis of blessings will also reap blessings. Could not be clearer! Now, if we agree that the first part of the verse is the exact opposite of the second, then the first part must mean… he who “does not” sow on the basis of blessings will reap “something else” than blessings. The whole purpose of verse 6 is to state God’s perspective regarding giving. There are only two ways to give: either one gives 1) for the “sole” and “unique” purpose of blessing someone else or one gives 2) for “any other” reason than simply blessing someone else. Please note that the opposite of “on the basis of blessing” is any other reason than to bless. “On the basis of cursing” certainly falls in that category, but so does “on the basis of money”, “…of fame”, “… of greed”, “…of praise”, “…of obligation”, “…of constraint”, etc. 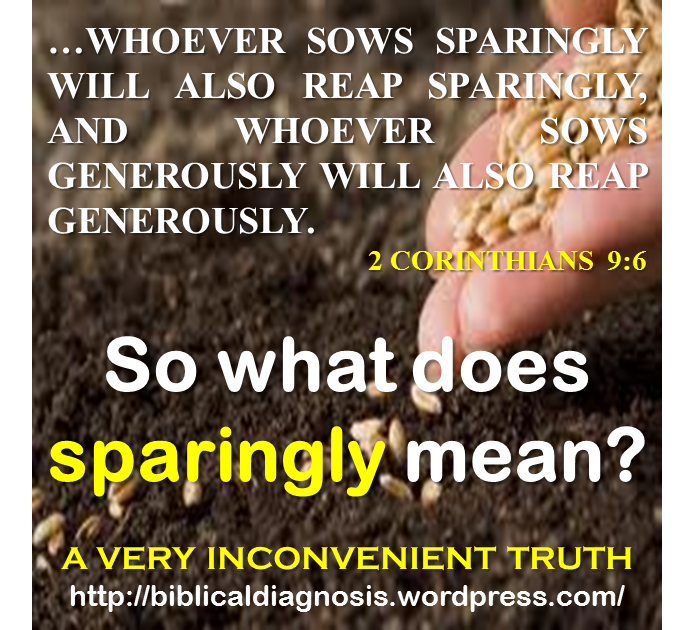 Just like “on the basis of blessings”, “sparingly” refers to the intention behind the giving, not the quantity given. But the intention in this case is any intention other than just blessing the other. The argument in this article is that sparingly is nothing more than the opposite of on the basis of blessing. And because of it, understanding it properly should really not be a problem. The problem is that this simple understanding gets completely obscured when the second part of verse 6 is not properly translated in the first place. 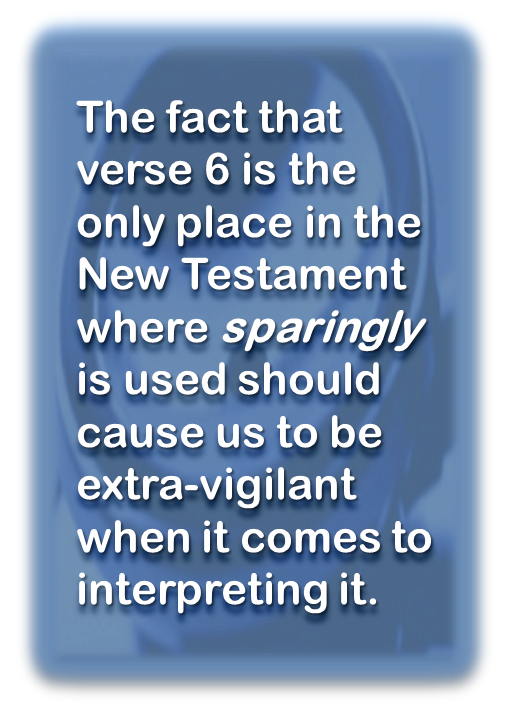 In addition, the fact that verse 6 is the only place in the New Testament where this adverb is used should cause us to be extra-vigilant when it comes to interpreting it. The argument postulated is that because of it, the best place for its interpretation should be this very verse – which is the immediate context of its use – rather than some secular source. And this allowed us to conclude that sparingly refers to the motivation behind the giving, to the exact same extent that on the basis of blessing does. Yet, one may ask…“But what if, despite all the arguments presented in this series, there is still room for the notion of quantity in verse 6?”. Could we be wrong all the way in believing that motivation is the one and only focus? We shall investigate that route in the next article. Indeed…“Suppose these terms really refer to quantity…”. In this series, we are making the argument that, in 2 Corinthians 9: 6 and 7, God does not make at all reference to the quantity one gives. In quite a contrast, we are arguing that the sole focus (and emphasis) of this passage is on the intention behind the giving. Click here for Part 1. Are you ready for some Bible translations? Let’s revisit verse 6, but now looking at not one, but three (3) popular bible translations: The New International Version (NIV), the New King James Version (NKJV), and the New Living Translation (NLT). 2 Corinthians 9:6 [NIV] – Remember this: Whoever sows sparingly will also reap sparingly, and whoever sows generously will also reap generously. 2 Corinthians 9:6 [NKJV] – But this I say: He who sows sparingly will also reap sparingly, and he who sows bountifully will also reap bountifully. 2 Corinthians 9:6 [NLT] – Remember this—a farmer who plants only a few seeds will get a small crop. But the one who plants generously will get a generous crop. We see that verse 6 identifies two courses of actions leading to opposite results. The first – sowing sparingly – results in reaping sparingly, while the other – sowing bountifully – results in reaping bountifully. These two actions are claimed to be making reference to the quantity sown: “sparingly” versus “bountifully” respectively. 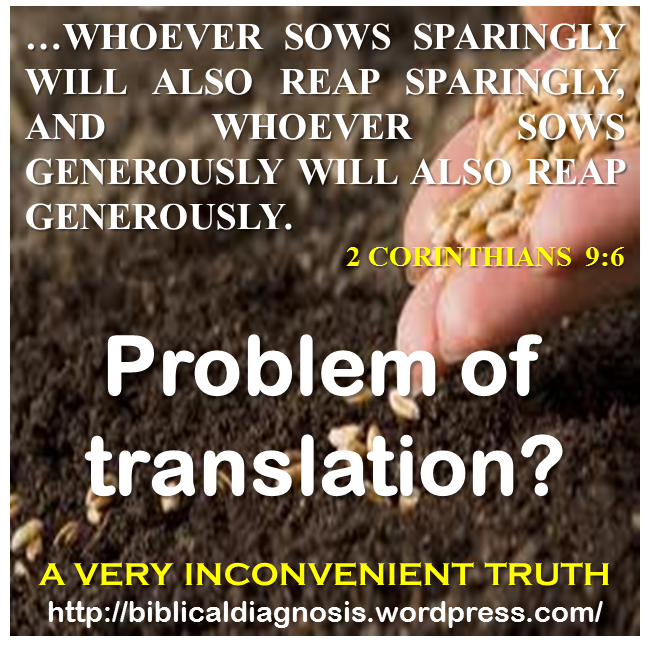 In fact, the NLT version makes this specific claim very explicit with its translation: “planting a few seeds versus planting generously (in other words, planting many seeds)”. There is no doubt that the three Bible versions refer to how much one sows. But wait…what is that Greek word again? See, the word that was translated “bountifully” in the NKJV and “generously” in the other two versions is the Greek word eulogia, which means blessing. This word – eulogia – actually appears in 15 other places throughout the New Testament. And in most of them, it is translated (guess what)…“blessing”. Let us look at just two such instances (Galatians 3:14 and Hebrew 6:7) in both the NKJV and the NLT. Galatians 3:14 [NKJV] – That the blessing (eulogia) of Abraham might come on the Gentiles through Jesus Christ that we might receive the promise of the Spirit through faith. Galatians 3:14 [NLT] – Through Christ Jesus, God has blessed the Gentiles with the same blessing (eulogia) he promised to Abraham, so that we who are believers might receive the promised Holy Spirit through faith. Hebrews 6:7 [NKJV] – For the earth which drinks in the rain that often comes upon it, and bears herbs useful for those by whom it is cultivated, receives blessing (eulogia) from God. Hebrews 6:7 [NLT] – When the ground soaks up the falling rain and bears a good crop for the farmer, it has God’s blessing (eulogia). Did you notice that even the NLT translates this word as “blessing” in both instances!? And actually, it turns out that save only one (1) other place (Romans 16:18), 2 Corinthians 9 is the only place where this word eulogia is not translated “blessing”. Therefore, in the face of such exception, one must ask…Why? Why is eulogia not translated here as “blessing” as it is everywhere else? This fact alone should cause us to look further into what appears to be a blatant discrepancy. In all of those places where the word “blessing” is used, what is highlighted is the good intention of the one giving. Simply the intention to bless, not more and not less. In the case of Galatians 3 and Hebrews 6, the one who gives is God. When we read these passages, we cannot help but realize that what is received is something good, and that it was given with the best of intentions…it was given, literally…to bless. That is the focus in those passages. How much quantity you said it was? The one giving gives because he or she knows how much it will bless the recipient. There is simply “no” indication of the quantity given other than it must be the right quantity. Let us think about it for a minute. 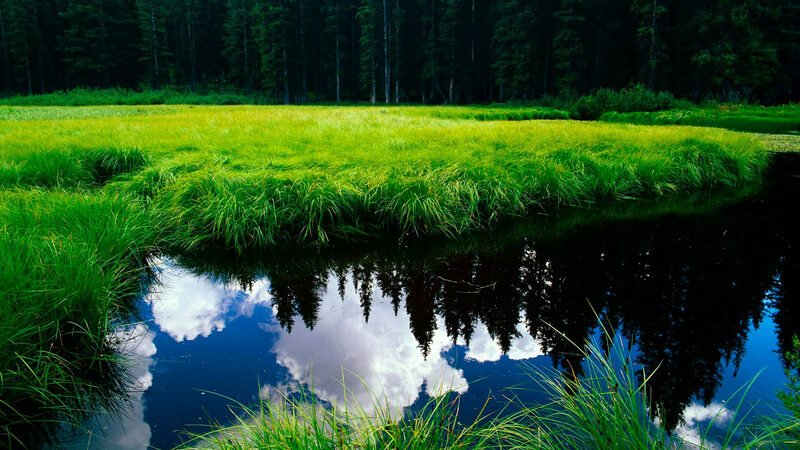 Back in Hebrews 6:7, how much quantity of rain does the earth receive from God? Does it receive a lot of it? We all know that too much rain could be very bad. What about a little of it? We all know that too little rain can be very bad as well. So what is the right answer, because it is a fact that the earth does receive some rain?! The only right answer pertaining to quantity is that the earth receives the right, perfect quantity of rain. This bears repeating. 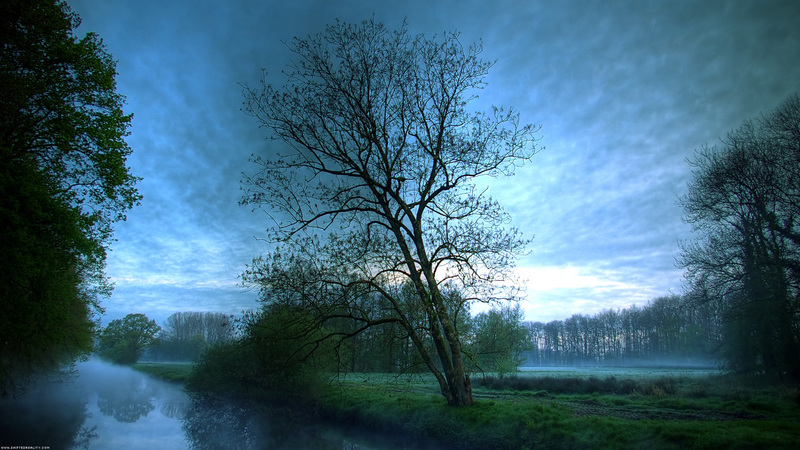 The earth receives the right quantity of rain from God. And being the right quantity is one reason it is a blessing, otherwise, it would not be! Too little and the earth would starve, too much and it would saturate. Galatians 3:14 is even more profound. What was the quantity of the blessing Abraham was promised? That’s a good one huh! All we can say with assurance is that it was the right quantity…that’s all, the right quantity! Therefore, we see from these records that by its very definition, a blessing already embodies within itself the notion of right quantity. 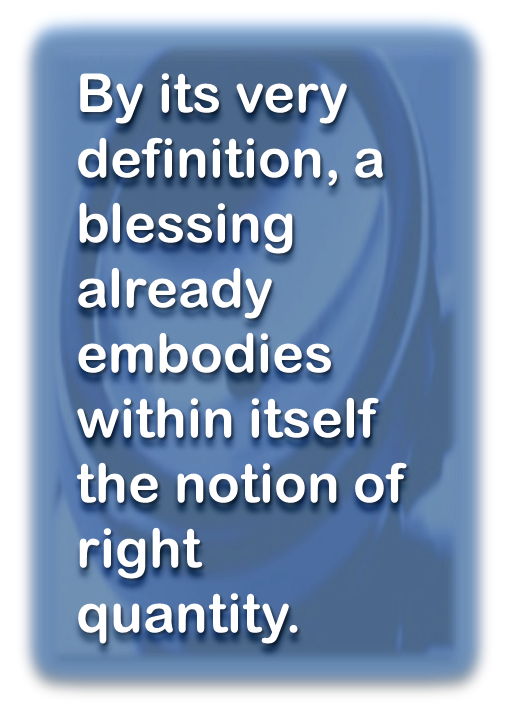 The right quantity is one of the attributes that makes a blessing what it is…a blessing. One: Bible translations. They introduce in their own rights a host of issues, as was already illustrated previously. Here as well, it is manifestly no different. None of the three popular Bible versions cited here used the right word…blessing! Why?